This house has 3 bedrooms- 2 en-suite twin rooms upstairs and a double room down stairs next to the bathroom. The kitchen has a fridge, cooker, dishwasher, washing machine and micro-wave. The living room has freeview TV. 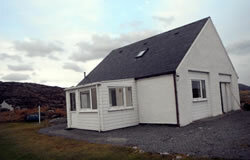 The Old Byre is in the lovely village of East Kilbride and is an ideal base for anyone wishing to explore the beautiful Uists, Eriskay and Barra. Please note that there will be an extra charge for fuel, which we charge at the rate it costs us.